I've been taking a matte painting class for the past six weeks with Heather Abels through CG Masters Academy. Just two weeks left in the class, and I have learned so much! We started the class with a project to turn an aerial photo into moving footage. Then we jumped right into working with footage for the rest of the course. I learned how to do some keying in Nuke for a sky replacement, building geometry from camera trackers, and creating a set extension from footage and simple geometry, I'm also learning more about good camera projection set ups, and how to sculpt the geometry for organic modeling so the elements don't look "cardy." Here's a peek at my last project for the class. This is my initial geometry setup. I have a lot more sculpting to do, and need to break up some of the elements more. But this was a good start for checking the parallax and coverage for each of the elements. 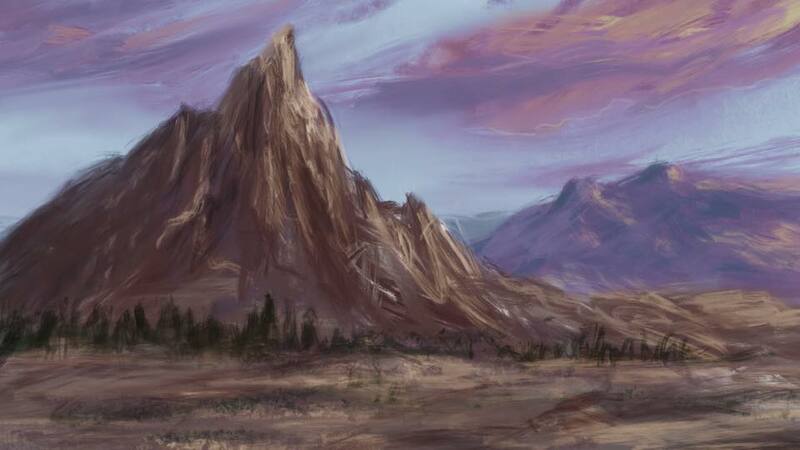 Recently I discovered the Virtual Plein Air group on Facebook. The concept is to find a location with an online map (like Google maps or Mapcrunch), go to the streetview and move the camera around til you find a nice spot, then start painting! This one is in Manu'a, American Samoa. 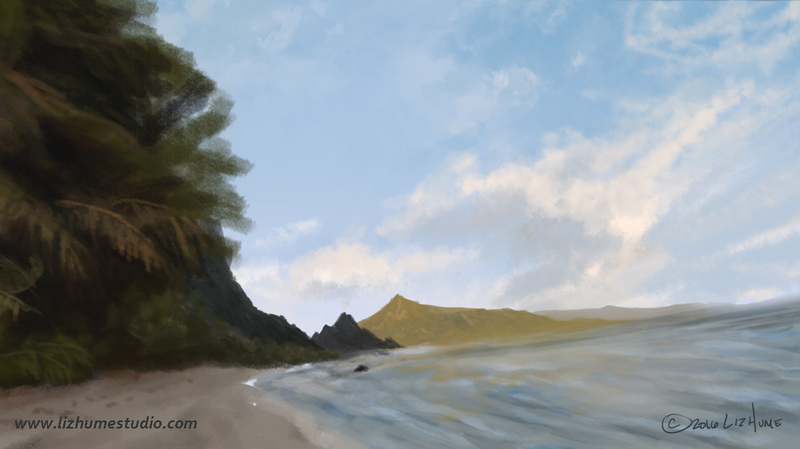 It's not quite like real plein air painting, where the lighting is always changing and the clouds are moving and changing shape, but it's still fun to "explore" new places! Just a few days ago I enrolled in the MP4FM (Matte Painting for Film) Camera Projection Boot Camp by Garrett Fry. I'm excited about getting more in depth info on creating complex camera projections for my matte paintings. I've been using camera projections in Maya for a while, and more recently started doing them in Nuke. I've learned some really cool stuff so far, like how to make a nested projection, and setting up multiple projection cameras for a complex shot. I already have some ideas for future matte paintings to try out these techniques!